"From the start, the Run for the Schools 5k was all Tom Kelly. 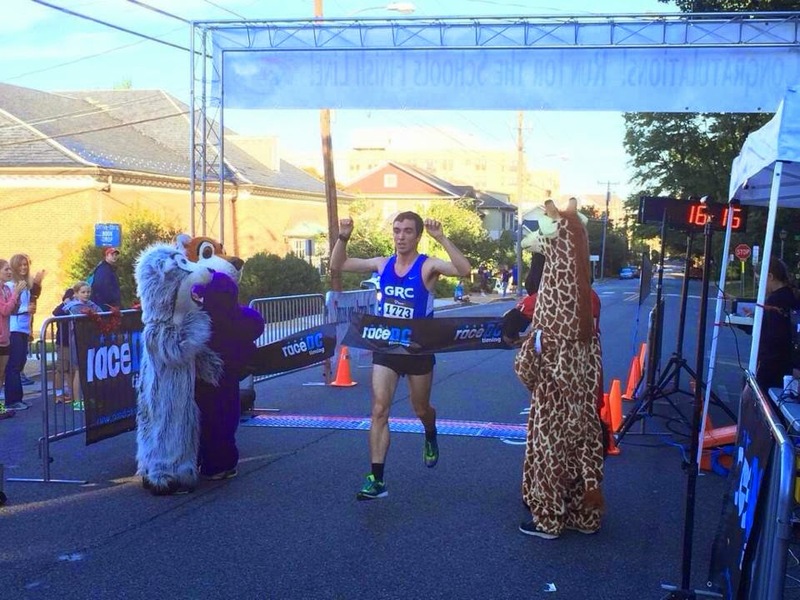 He ran to win, and win he did," a giraffe reported after Kelly won the Falls Church event in 16:13. Maura, meanwhile, won the Navy 5 Miler in an event-record time of 30:03, while Wertz defended his title at the Navy Federal 5k. The race of the day at Navy 5 Miler and Navy Air Force Half, however, said Coach Jerry, was Kristin's 1:20:40 in the half -- a humongous six-minute PR. This was a major breakthrough for Kristin, and while it was not unexpected given that she ran superb workouts all summer, it's one thing to run well in practice, and quite another to run well in races, and Kristin delivered when it counted. Kristin executed her race plan perfectly, which was to stay comfortable through 10 miles, and she would have run much, much faster if she had opened it up earlier. We're going to see many, many more major breakthroughs from Kristin in the weeks and months ahead. There were other notable performances at Navy: Namely, Maura's meet record in the 5 mile of 30:03. Maura missed the start of the race last year, but she was on the line when the gun went off this time around, and ran a strong race considering that she was solo from the mile mark. Sara's GRC debut in the 5 mile. Sara had a fantastic senior year at Dickinson, where she was a D-III All-American in cross country and outdoors, placing 4th in the 10,000 at Nationals, and ran PRs of 4:33 for 1500, 16:53 for 5,000, and 35:40 for 10,000. Sara is going to have a shot at rewriting the GRC record book on the track this spring, so keep an eye on that young lady. Paul Balmer's half PR of 1:10:59. Despite running the second half of the race totally solo, Paul PR'ed by a minute, which was a very encouraging sign as he prepares to make his marathon debut in Portland on October 5. Kerry's very controlled 1:21:20 in the half. 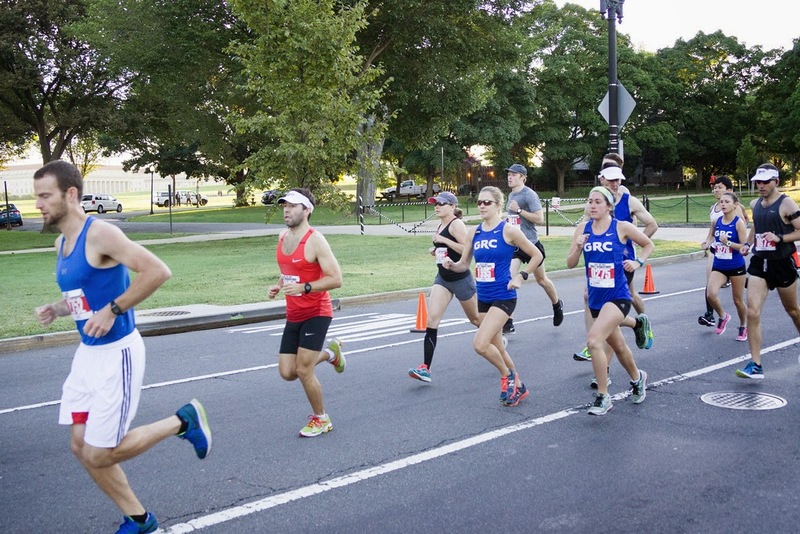 Kerry is just starting her training cycle for the California International Marathon in December, and she showed that she is ready to get down to business as she prepares for a major PR in Sacramento. Emily's excellent half debut of 1:24:46. Emily has almost no experience with longer distances on the roads, and her goal was to break 1:30, so we can call that mission accomplished. Strong races in the 5 mile from our contingent of recent graduates. Sean O'Leary (Blur) ran a very solid 25:49, followed by Stewart (Stu) in 25:56, James in 26:27, and Kyle in 26:38. Blur and Stu rebounded nicely from less than stellar 5ks in early September, and they will continue to improve as the season goes on. James had not run a race that long in almost two years, and we will see continued progress from him on the roads as he builds his strength for track season. Kyle's training has been limited by a minor injury the last two weeks, but we'll be seeing much more from him this fall, and beyond. Strong races in the 5 mile from our contingent of grizzled veterans. Jerry Outlaw sharpened up for the Philly half in 25:42, followed by Dickson in 25:51, Dave O in 27:18, and Patrick in 27:21. This was Dickson's best performance in recent memory, and his focus on shorter races this fall is starting to pay off. Kristin, center, on the way to a breakthrough performance. Cheryl Young took this photograph and many more.